Express photo by Willy Cook Retired Col. John O?Connor sits proudly at his desk in Sun Valley, recalling a generations-worth of Cold War memories. Memorial Day touches us all—many have served, and most have a relative who has given his or her time, energy and perhaps life to this nation. And every American, regardless of generation or political affiliation, has benefited from the sacrifices of the men and women of our Armed Forces. 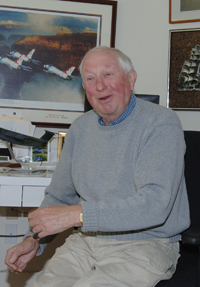 Sun Valley resident and retired Air Force Col. John O'Connor is one who served—for 30 years he logged over 35,000 hours of flight time watching over the United States during the longest war on record—the Cold War. "At first, I didn't like flying at all," O'Connor said of his first trip in an airplane on the now defunct Mohawk Airlines. However, after spending two years in the Reserve Officers' Training Corps at the University of Vermont and with an impending stint in the military looming after graduation, O'Connor decided the life of a pilot would not be all that bad. In 1956, he enlisted in the Air Force and attended flight school in Marianna, Fla. and at Reese Air Force Base in Lubbock, Texas. The Korean War had ended only three years before O'Connor's enlistment, establishing the demilitarized-zone between North and South Korea, Berlin was divided, the French were leaving Vietnam and America was readying to take its place—to call this a volatile time would have been an understatement. As for O'Connor, he was stuck in Marianna. "It was in the middle of nowhere ... and it was a dry county," O'Connor joked. In all seriousness though, he said he was part of the last class to go through flight school training on the B-25 bomber. The B-25 was made immortal on April 18, 1942, when it became the first United States aircraft to bomb the Japanese mainland during World War II. During the Vietnam era, O'Connor was based in Louisiana and England, where he was regularly called on to fly DC-6s and Boeing B-47s into Hong Kong to transport troops out of Vietnam to destinations throughout Southeast Asia for well-deserved "R and R" (rest and relaxation). As the B-47 was phased out of military use, O'Connor was moved up to flying B-52s out of Griffiss Air Force Base in Rome, New York. On Oct. 22, 1962, the world teetered on the brink of nuclear holocaust. This was the day President John F. Kennedy announced that newly acquired intelligence indicated the Soviet Union was building secret missile bases in Cuba, 90 miles off the coast of Florida. Kennedy scrambled bombers into the air and ordered a naval blockade of Cuba to prevent Russian ships from approaching the island. In response to the blockade, Premier Nikita Khrushchev authorized his Soviet field commanders in Cuba to launch their tactical nuclear weapons if invaded by U.S. forces. As the leaders of the world's nuclear powers stared each other down, O'Connor and a group of elite American pilots were flying over the Atlantic Ocean in an effort to locate the Soviet ships headed for Cuba. "At this time, we didn't have satellites," O'Connor said. "And we had pretty powerful radar on the B-52s." The Soviet Union eventually blinked and Khrushchev ordered all Soviet supply ships away from Cuban waters and agreed to remove the missiles from Cuba's mainland. After seven days, the world breathed a sigh of relief. Throughout the remainder of O'Connor's years in active duty he flew numerous "airborne alert" missions. These consisted of 24- to 26-hour flights with two mid-air refuelings. At this time, "everyone had designated targets," O'Connor said. In 1966 O'Connor retired from active duty and joined the Air National Guard where he served for the next 20 years. At the same time he was also hired as a pilot for Pan American Airways, commonly referred to as Pan Am, where he eventually captained the 747 "Jumbo Jet." In 1989, O'Connor was living in Berlin during one of the Cold War's biggest events—the fall of the Berlin Wall. "It was a wild time," he said. "People literally flowed in from East Berlin." In 1993, O'Connor and his wife made Sun Valley their permanent home. Since that time, he said, "I have paid my dues to the civilian world." For three years, he was commander of the American Legion Post 115 in Ketchum. He also served six years on the Ketchum Area Rapid Transit board, six years (two as president) on the board of the Elkhorn Association and worked with the city of Sun Valley on its comprehensive plan. As for the current crop of young men and women serving in Afghanistan and Iraq, O'Connor said, "they are probably the best they've ever had. Keep in mind there's no draft—those guys volunteered to serve." In addition to the satisfaction gained from serving his country, O'Connor gained something much more valuable from his service in the Air Force. While stationed in England, O'Connor met the love of his life, Elaine. Originally from Pocatello, Elaine was in Oxford teaching fourth and fifth grades. Elaine passed away last week after battling cancer for more than two years. "The doctor gave her two months. She lived for two years and two months after that," O'Connor said, with a gleam of undying pride in his eye.